Malleable iron fittings are lighter fittings in 150# and 300# pressure class. They are made for light industrial and plumbing use up to 300 psi. 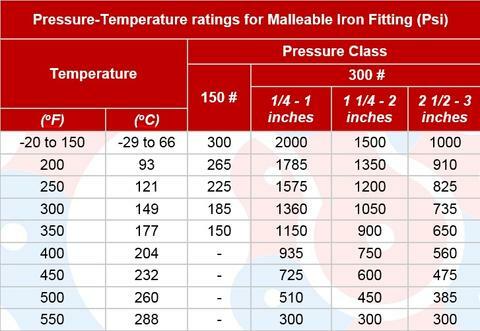 Some malleable fittings such as floor flange, lateral, street tee and bullhead tees are not commonly available in forged iron. Malleable iron offers more ductility that is often required in light industrial use. Malleable iron pipe fitting is not good for welding (if you ever need to weld something to it). Malleable iron fittings, also called black iron fittings, are available up to 6 inch nominal pipe size, though they are more common to 4 inches. Malleable fittings include elbows, tees, couplings and floor flange etc. Floor flange is very popular to anchor items to the ground. Forged Iron Pipe Fittings are available as socket weld pipe fitting or threaded pipe fitting. Forged fittings are made of A105 (carbon steel), stainless steel or nickel alloy. These fittings are thicker, heavier and are intended for heavy industrial use. Forged Iron Pipe Fittings are available in 2000#, 3000#, 6000# and 9000# pressure class. These fittings are more common in 3000# and 6000# (90% of the time). Threaded pipe fittings and socket weld pipe fittings are available up to 4 inch nominal pipe size. 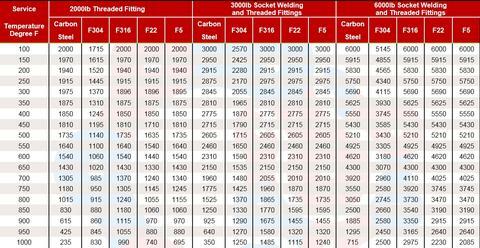 See the table below for pressure and temperature rating of these fittings.